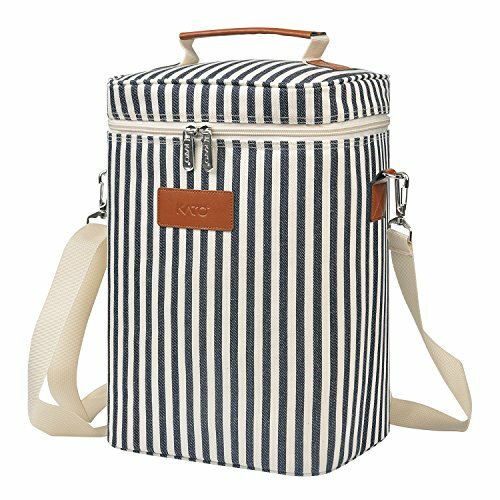 •This beautiful Kato deluxe wine travel carrier cooler insulated tote bag let you put your favorite drinks to restaurants, picnic, party, beach or any other gathering occasion. •Thermal shield insulated material, thick padded ensure your drinks stay in cold for hours. •Interior divider easy separated 4 bottle regular size red wine or champagne without clinking or shattering and allows you to convert these wine bag into a picnic bag. •Inside of the bag is not sealed with waterproof material. Use ice bag if needed, but don't put ice directly. PADDED & THERMAL INSULATED - PU thermal insulated material and 5mm PE foam padding protect your bottles of wine from external collision, keep 4 bottles of wine intact and well chilled for hours. REMOVABLE DIVIDER WITH VELCRO - The inside padded divider with 2 belts of Velcro can keep 4 bottles of wine separate and prevent them from crashing with each other. Furthermore, you can use the wine bag as a insulated cooler bag for picnic or travel when you take out the divider. AMPLE STORAGE SPACE - 8.6" x 7.1" x 12.5" (L x W x H), the wine carrier has ample space for 4 normal size bottles of wine. IDEAL WINE LOVER GIFT - Elegant stripe pattern and pratical design make this wine carrier suitable for all age wine lovers. If your families or friends are wine drinkers and love to share wine with others, this wine carrier would be a excellent gift for them.